BLACK BLOSSOM descends from another of MacDonald Ranches most sound-structured, best-uddered and top producing cow families. Both her mother and grandmother are enrolled as donor dams in MacDonald Ranches ET program. Her dam is a very feminine, attractive and productive NEBRASKA daughter. 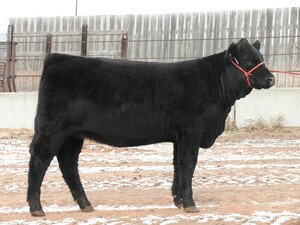 Her grandmother, Lil Blossom, was a class winner at the 2003 National Salers show and also the dam of MAC TONYA 43T, a class winner at the 2008 National Salers show. BLACK BLOSSOM combines the productivity of a great cow family with the style and showiness typical of her sire, DJF ROLEN, who was the 2006 National Reserve Champion bull. BLACK BLOSSOM offers double opportunity as both an outstanding show prospect and a great foundation female for your breeding program.